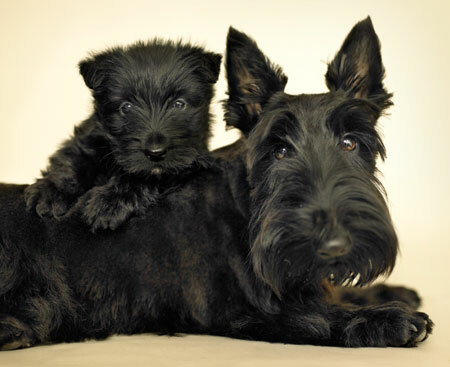 The Scottish terriers, also known as Scotties, are short-legged British terriers. They are one among other go-to-ground and wire-coated terriers developed in the highlands of Scotland. The Scotties are said to have jaunty attitude so they are often used to represent advertisements of the country to where they originated. However, Scotties' nature is not in coherence with their public image or trademark. In fact, Scotties are like the citizens of his native land who are independent, stoic, and fiercely loyal to their masters. They also adhere much to their own privacy. Scotties, Westies, and Cairns are very similar regarding their appearance. The Westies and the Cairns are, in fact, closely-related. The Westie can be considered as the white variety of the Cairn who has a coat of any color but white. Westies are hybrids of white dogs crossed with Cairns of western Scotland. 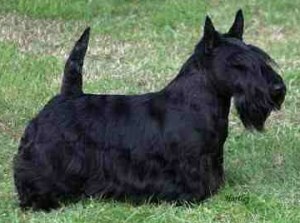 Scotties, however, have longer heads and bodies, have generally dark coats and are aloof than the other two. • Their coats need special care to maintain its appearance and texture. It is suggested that they should be subjected to professional grooming once or twice each year for their coats to stay wiry and firm. • The fur needs to be combed a couple of times in each week and even needs occasional trimming. • Scotties' dead hairs should be plucked out through stripping. Using electric clippers will only make their coats dull and soft. • Play with them. Hunting and squeaky balls and toys are their favorites. The origins of the breed are obscure. It was noted that forerunners of Scotties were sent to France's Royal Highness by King James I of England during the 16th century. Later on, three different terriers were revealed as Scotch Terriers, which included the Westies, the Cairns, and the Scotties. The Dandie Dinmont variety had also been noted as closely-related to the abovementioned terriers but its apparent physical differences categorized itself as a separate breed. Terrier dogs that were bred in Britain were developed to hunt vermin that ate grains, and pestered eggs and poultry farms. Most breeds grew as scrappy and courageous dogs and were trained to follow badgers or foxes into their dens. Their wiry coats and soft undercoats protected them against rugged terrains and harsh climates. If you want to have a Scottie in your life, you should not be impulsive about the matter for animosity and lack of proper training will only harm and traumatize the dog. If properly taken cared of, this breed can even appoint itself as a guardian of the family. It can also be fiercely loyal, that is it can protect you even if it means endangering its own life. To this effect, I guess you must agree that a Scottie is a dog that is second to none.